One week out from the terrorist attacks and it's still not quite back to normal. On the same day as the suspicious fruit sauce incident on the metro, Anthony and I go to the market to re-stock on fruits and veggies. After we leave our block, we see that it's been cordoned off -- because we are close to the Great Mosque -- and that there's a long security line to get back in, as if we were in an airport and not the middle of the streets of Paris. By the time we return from the market, there is no line, but that's because they're no longer letting anybody in: we are prevented from re-entering our road for about half an hour because of...you guessed it...a "colis suspect". It turns out to be nothing, and I suppose I'm glad they're being over-cautious, but it's hard to describe the weirdness of just sitting there wondering when we can back into our home. And whether we should get back into our home. There are newscasters there, but the suspect package scare isn't even registering on their news. They're all simply there to report on the first Friday service since the attacks. I love that one woman has chosen to bring her American flag umbrella to the scene. 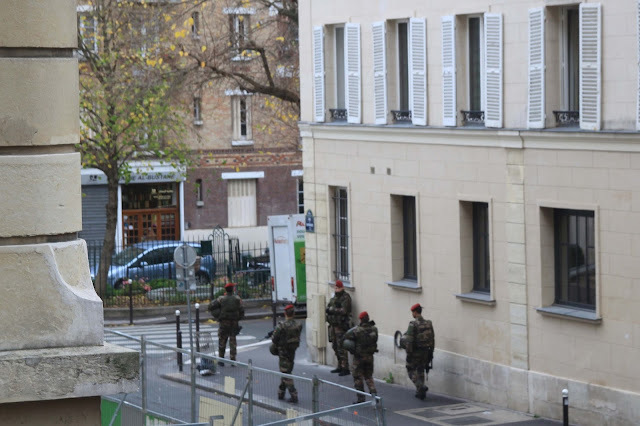 The girls' exam that was canceled the morning after the Paris attacks was rescheduled and took place this past Saturday morning, a week later, at the American School of Paris. Thank goodness our girls are comfortable with independence, because it was not as expected: I was not even allowed up to the front door of the school, stopped by several guards with machine guns. I'm happy to know the school is keen on security, but that means that the girls have to go in, find their way around, and fend for themselves for the exams. While the girls are taking their test, I find an adorable little café, overlooking a quaint market and sweet little church in the village of Garches. It's a 3.5 hour exam, so I have quite a lot of time to shop and then read at my window-side table. It's not a market for tourists at all, yet there's an accordionist walking around the market. This is what I love about France. The old lady in the beret, my neighbor at the next table smiling and laughing -- my heart kind of aches at how normal, cheerful, and peaceful this is. I want to bottle this feeling. Coincidentally, the book I'm reading in the café, Five Quarters of an Orange, by Joanne Harris, is about World War II and the weirdness, violence, intolerance, and humanity (and sometimes lack thereof) in a French village at that time. Somehow, it seems extra fitting. I must say that despite the weirdness in the air, the mood has improved since last week. There's security everywhere and bag-checks, but most places have re-opened to the public, including the Eiffel Tower and, more surprising to me, la Grande Mosquée. The gardens are so beautiful and peaceful there. Sigh. There are shows, concerts, school outings, markets, public transports, train and plane service. There are lights on for the Christmas season and the annual Christmas market festival set-up on the Champs Elysees. There are even the displays heralding the release of this year's Beaujoulais Nouveau (though believe me, coming on the 3rd Thursday of the month, which turns out to be 6 days after the attacks, this has to be the lowest-key release I've ever seen). On the other hand, there are no street performers or tourists, even in the heart of the city. That's partly because a few days ago, it suddenly turned -- as if a switch had been flipped -- from fall to winter. It's absolutely freezing out and, in addition, even gray and wet. Somehow, that seems appropriate. Here is the official motto of Paris, which suddenly is on every lip (and many a wall): Fluctuat nec Mergitur, Latin for "She is tossed on the waves but does not sink." 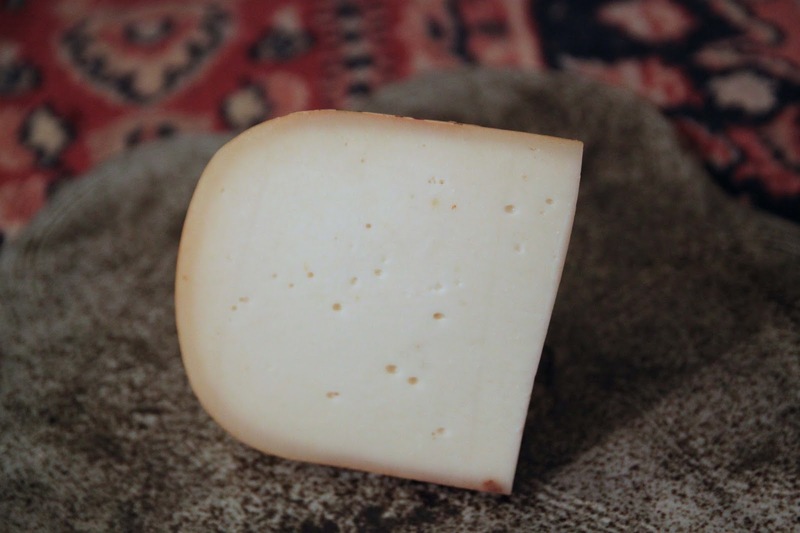 Maigre du Nord, or "Thin from the North" is a farmhouse cheese made from thermized (heated but not quite pasteurized) goats' milk....in Belgium. Yes, for the first time in A Year in Fromage, I'm featuring a non-French cheese. But then again, my Year in Fromage is already over two years, so I never promised logical perfection. To be fair, I won't count it in my final 500, which I'm rapidly approaching. Not only is it almost-pasteurized, the milk is low-fat, hence the name "maigre" (thin, skinny, meager). That makes the cheese lower-fat than usual. Given the fact that it's low-fat and nearly pasteurized, I expect to be seriously disappointed and only buy the smallest sliver possible. Well, the joke's on me, and it just shows that prejudice in any form is unwarranted: this cheese is delicious. It's sweet, nutty, and addictive, and tastes more like a Comté than any goat cheese I can remember. The texture is just at the edge of crumbly and creamy. Not only do my children love it, so do three young children (3rd and 6th graders) visiting from the US who are not normally big stinky-cheese eaters. And here they are, wolfing down goat cheese and begging for more. Honestly, it's a treat. I find this cheese at the Garches village market (just outside of Paris) while waiting for the girls to finish their exam, re-scheduled because of the terrorist attacks. At the same market, I also find a goat cheese shaped like the Arc de Triomphe and then, on the way home, pass the Arc de Triomphe. The weather suits the general mood, frankly: weepy and gray. The Maigre du Nord is a surprising find for me, delicious and nutty, and not at all what I was expecting, especially since it's a low-fat almost-pasteurized cheese. It's a much-needed bite of happy amidst all this gloom, just as the market was a much-needed spot of cheery for me. And, finally, Maigre du Nord is a Belgian cheese and, therefore, my Year in Fromage show of support for the authorities and people of Bruxelles, currently facing their own days of terror. (Françoise, my most loyal reader in Bruxelles: this cheese is for you!) In order to be scrupulous about my cheese list, I won't count this as one of my 500 French cheeses, but it's the cheese that's in my heart (and, currently, my arteries) as the appropriate one with which to wish the people of Belgium the best possible outcome of the Bruxelles lockdown and to wish all of us days, cities, streets, homes, lives, and a world filled with peace.